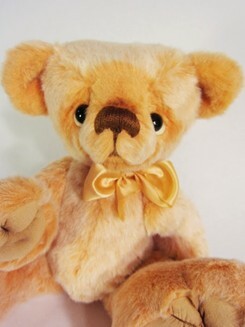 Jill Johnson of Jilly Bears is accustomed to bringing interesting things to life. As a full-time producer for the wildly popular PC game "The Sims" by Electronic Arts, she's used to creating magic and brings that into the real world with her furry creations. 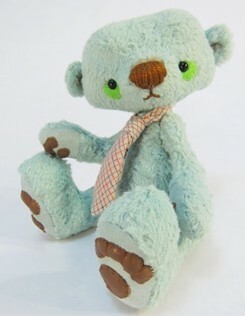 Living outside San Francisco in the beautiful Silicon Valley area, Jill balances her career in gaming with her blossoming business in bear-making. 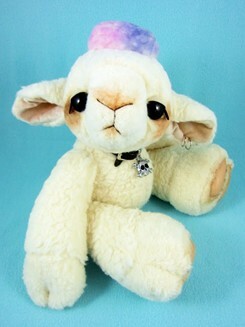 "I have always had a deep love for sewing and particularly in stuffed animals," Jill remarked. 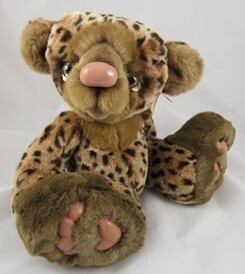 She created her own stuffed animals and had closets full of outfits for them. In addition to this, she had an unbelievable amount of exposure to live animals of all kinds while growing up. She spent most of her early childhood at her grandparent's buffalo farm in Hart, Michigan, with days spent trout fishing, chasing swans and feeding buffalo. She later lived in the Black Hills of South Dakota, in Rapid City right next to "Bear Country USA," a popular tourist attraction featuring lots of bears, rams, elk and many other fun-filled sights. "We spent lots of our summer on my Step-dad's horse ranch too, taking trail rides. Being fortunate enough to be surrounded by this much wildlife growing up, has given me a real love and appreciation for animals that I work to convey in the bears that I make." It wasn't a far stretch for Jill to combine this great love of animals with her talents for sewing and design. A couple of years after high school, she moved to San Francisco to earn her BFA in Fashion Design. "By the time I was ready to graduate, I was leaning towards illustration and children's wear. I was also realizing that my design tastes were not posh at all, but instead, slanted more towards the cute and cuddly." As fate would have it, she was offered a position at Electronic Arts when a recruiter met her at her graduation portfolio show. She's been a Producer for "The Sims" now for over 8 years and loves it. "As much as I adore my job, I was finding that I was going nuts not working on enough sewing projects. I felt this big, mounting need to create welling inside me and it was about to burst!" Taking three weeks off from work, Jill bought 25 books about artist's bear making techniques. 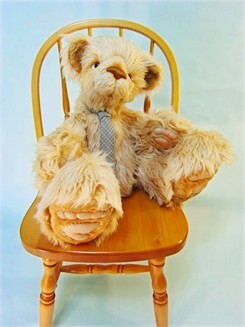 "I sat down to make my first bear and it was a long process. 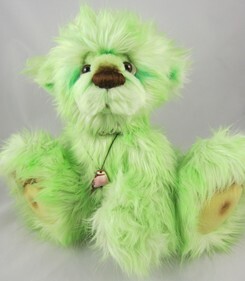 I made multiple prototypes, stabbed my fingers with leather needles but the end results was a huge fluffy purple bear with so much charm and personality that I knew this was what I wanted to do from here on out." Since that fateful time, Jill has spent every free moment of the last two years making teddy bears. Though she still considers herself relatively new, she is constantly trying new techniques and new patterns to get a better understanding of her own style. "I've been tinkering with clay noses and hand-painted eyes. One absolute constant that I like is huge feet!" 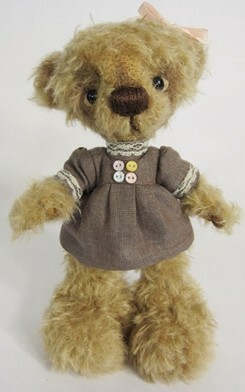 Jill sells her creations through auction sites, her own website, attends local teddy bear shows and participates in online shows too. "I've gotten to this happy place in my life where I'm somehow able to balance a full-time job with my obsessive bear habit." This gives Jill the amazing opportunity to create things not only in the virtual world but in the real world; an interesting juxtaposition. The virtual world can be fun to play in but it can't give you a fuzzy, warm hug. 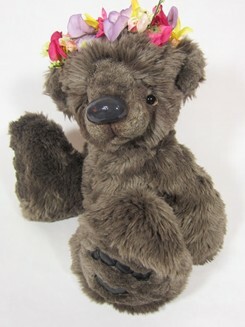 "My favorite thing about artist's bears," Jill revealed, "is the feeling of bringing a living, breathing character to life. I put so much of my focus on the face, making sure that I'm totally in love with the cutie looking back at me before I move on to the body." "Once the bear is done, it feels like you have the chance then of bringing a little joy into someone else's day." 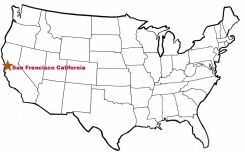 Where is San Francisco, California USA?